Am I being unreasonable to want my doctors to connect with me through mobile? Am I asking too much for them to experiment with healthcare apps so we can trade information? Am I being difficult when I get annoyed that I have to keep filling out the same paper forms at every office visit? Apparently I am. And like Rodney Dangerfield, when I ask my Boomer docs these questions, I get no respect. “I’m just learning how to use this smartphone, I don’t have time to learn about apps” my 65-year-old gynecologist grumbled while reaching for his pen and my huge paper file. When I tried to show my 67-yearold internist a weight management app I was using, he was courteous, but disinterested. “I can’t get my patients to go to Weight Watchers,” they aren’t going to use an app, he overgeneralized. He’s the managing partner of a nine physician office that has mounds of paper records everywhere. So I posed the next obvious question. “When are you going on electronic records,” I asked. “When they take my paper away,” he responded clutching my three-inch file against his chest like a prized piece of art. My podiatrist, a childhood friend in his late 50s, told me the high cost of converting to electronic records has him resisting change. “It costs too much to train everyone, and who knows when we will actually have to use them,” he explained. I love my Boomer docs; we’ve grown through adulthood together. They have been responsive physicians and I don’t want to leave them. I just want them to embrace technology so they don’t feel pressured to retire. Are my doctors out of the loop? I live in the suburbs of a major metropolitan city in the Midwest. Ok, it’s not Silicon Valley or Boston, but we have world renowned hospitals in our area. Our state, typical of most states, has an aging population that could benefit from mobile and telemedicine. I keep reading articles about how larger numbers of physicians are embracing mobile health. One recent study showed nearly 75 percent of U.S. physicians use smartphones at for professional purposes. 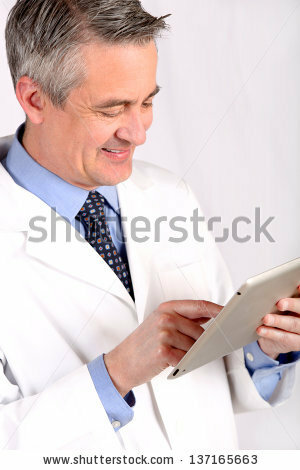 Manhattan Research reported that two-thirds of docs use tablets, more than doubling what is was in 2011. In addition, the Manhattan study revealed that seven in ten doctors had a self-tracking patient. The firm found that 75 percent of doctors believed that self-tracking leads to better patient outcomes. Of course, there are some connected doctors around; I just have to search for them. Recently at a party, I talked with a neurologist friend who uses a mobile app Lift Pulse to take patient’s tremor readings. And, there’s 72-year-old Dr. Michael Salesin, a Detroit area OBGYN who has been using electronic records for 15-years. “Do they think they can retire before they have to comply with the ACA?” I asked. “The ones who are in their late 60s think they can wait it out and retire. But the docs in their 50s recognize they have to adopt, they just keep fighting it. I don’t understand why,” he added. Salesin also recommends mobile weight management, pregnancy, menopause tracking and other symptom tracking apps to his patients. “The more information patients can track and provide their physicians the better the outcome,” he said. Ask your doctor for mobile app recommendations. Express your interest. If the office isn’t on electronic records, ask when it is going to be, and if not why not. Express your concern for having more accurate and secure medical records. Under the Affordable Care Act (ACA), nurse practitioners are going to treat more patients; talk to them about mobile engagement. They are the front line responders, the ones who have to deal with the disenchanted patients. Share your concerns with them. They’ll start pressuring the docs to change. As Boomers take a more proactive approach to managing their health care costs, they also need to take a more proactive approach in the mobile healthcare discussion with their physicians. Think about this..if you are recovering from surgery. Rather than trudging to the office, wouldn’t you rather send your vitals through a mobile app to your doctor’s smartphone, then follow-up with him/her via Skype or Facetime? It would save you and your doctor a lot of time and the information would be accurate and already in a format that could be used for tracking purposes. Editor’s Note: Do you have a topic or question for Boomer Voice? Email me at joan@socialmediatoday.com We would love to hear from you! Will Technology Make Primary Care Doctors “Whole”?